Posted by Nick Soveiko on Sunday, November 29th, 2009, filed under News. You can follow comment on this post through the RSS 2.0 feed. You can leave a comment below, or trackback from your own site. on this “secret gig for bankers” DP has the WORST audience they have probably had ever. I see nothing wrong with performing for bankers!??! Maybe it was a great show too? I’ll try to grab this one. I’m not going to let envy ’cause I wasn’t invited get in the way! Not sure I understand, although I detest bankers and do find them among the worst group of corrupted individuals on the planet, I don’t see what that or even the audience has to do with ww distribution of this item. I must’ve missed something. As far as this product is concerned, the price is mighty high for a 60 minute show, most 2 DVD sets sell for cheaper. But the greed must be contagious or something. Oh yeah, it was for a banker, I almost forgot. The set-list factor is pathetic in this and any case where they have done so. It really does tend to bother for obvious reasons. Again, what does the crowd have to do with distributing it world-wide, and for chrissakes what does the Kremlin gig have to do with it, other than the fact that both were private gigs? What is the big deal? I look forward to ALL well recorded concerts from the Purps. I don’t care if there was one gimp and a one armed man as the audience. I can’t recall basing any enjoyable performance on how large or small the crowd was. As a matter of fact, the smaller the better. Less BS around me and more focus on the band. Now as far as the price for the DVD, that’s a whole different story. I hate to be gowged and hope it’s final production makes the price right…. Oh and I left out…..”What a Great Picture for the Cover”. DP always complain of not having a good album sales. They will ALWAYS have bad sales untill they learn what to release and what NOT. I have to admit that a Swiss banker doesn’t deserve what I said, being American I know where I’d rather have my cheese. But this is obviously possible because he may as well be the executive producer, but I can’t say I blame him. I’d do the same thing if I were him. How is Gillan Performance On This DVD. hm, bankers are wankers – I can live with that since most of us are members of that club anyway. However 20 Euros for a DVD like this is inexpensive if you consider the cost of production. Remember, the gig was for free, no entrance fee was asked for, not one sponsor gave a little help. Why there are DVD’s from France and Michigan? Nobody took the risk for a production? Give this DVD a chance-you will not regret. Great news what you are publishing here. The concert was perfectly wonderful. We are awaiting the DVD impatiently. hope they got banker CEO pay too! I really can’t understand you…. DP sold out 2 shows at Wembley in the past, now they hardly sold-out Apollo. They sold out Birmingham NEC for 2 nights in the past days, while on the last UK tour only 3000 tickets were sold for NEC show. – they sound like a schoolband. No enthusiasm. 10 songs that we’ve heard/seen time and time again ?? @ Is it all about being world’s best selling act? ref #19–some so called super groups get millions and have not done anything in years–DP deserves those millions for driving on. i am sure they are not one check away from homelessness–but i think they deserve the status and funds of a led zep–stones–areosmith–etc…DP plays circles are those dudes. Steve’s guitar sounds terrible, like a cheap amp-sim. Makes me wonder if they recorded direct. Some of the comments posted here are beyond belief. What’s the problem? If you don’t want it or don’t think it’s worth having – then don’t buy it. I won’t be buying it for reasons I’ll keep to myself but I don’t see the need to piss on other people’s enthusiasm for the band. Hi Supa. Steve’s guitar will sound much better on a B&O 5.1 device. Maybe the banker will give you a loan 😉 ? BTW: I fully agree with Made in England. Henrik, #23- Wake up and go back to sleep. Who is typing for you whilst in a straight jacket, pray tell? james jay #27- I make my bucks working my corporate career. Musicians’s make their bucks with their careers. The beautiful thing in which to appreciate, is that they do not mail anything in. Henrik states “no enthusiasm”. But with all respect for he and his straight jacket, I have never seen this much enthusiasm in this DP lineup, ever. One would have to be blind beyond belief to no see the OBVIOUS. Supa #28- You’re hearing this over the freaking internet… ‘Nuff said…. Well, I cant wait to pick up a copy of the Zurich DVD. Having just seen Purple in Both Copenhagen and Aarhus this year, we could not have asked for more. Indeed local media awarded 5 stars to their performance. Agree with #29 – those who dont want the DVD – dont buy it, for me it sounds like a good collectors item. It’s Deep Purple and they have kept it going for years and still have what it takes to draw an audience of all ages. Plus there is never a gimmick, just pure raw classic rock!!! Like they said “Were taking the scenic route” ahmen to DP. The video looks good. Nice production values apparent on the preview. I am curious as to what Ians voice sounds like. Aside from the closing thank you, there is no Ian in the preview. I’m buying it anyway. What next? A private gig for MP’s at a castle full of rascals only available if claimed on expenses and undisclosed to the great unwashed public! After the Kremlin fiasco and flogging a few dodgy motors at the ‘Car show’ this is true to form, It wouldn’t surprise me if they turned up on ‘The one show’ after a hard day on ‘Loose women’ and doing a medley of their greatest amusing anectdotes on Richard and Judy’s couch, coming up ‘Deep Purple the X factor’ a shelf stacker from Wrexham puts on a black wig and gives us a stunning rendition of ‘Money talks’! They don’t care, and neither do the fans, obviously. Or perhaps we’ll be seeing them at county fairs from now on…? I don’t see any filth in this at least not on their part… as I said, its obvious this is endorsed by DP, but not released or even produced by them. Correct if if I am wrong, but isn’t this item put together by the banker and his people? “The worst audience? I don’t think so, they simply might be softened by the clip producer, so you can’t hear their singing. A strange clip by the way. Some fragments of solo only, without a singer. No worth watching. Reading these comments makes me sad. I read so many complaints. If I was the banker I wouldn’t even continue. I thought that we were DP fans? Are DP fans not suppost to be enthousiastic of ANY new release? Who cares if it’s made by Wanker the Banker, Small Willy, Big Dipper or whoever. I for one am greatfull that the bankers made this possible and that they take the effort in letting us enjoy this show. I for one will certainly enjoy this dvd when it’s out. So, many thanks to the bankers that made this possible and please please please listen to the possitive comments. Cant they add Live In Basel, the Bananas promo gig? Call it Live In Switserland, having some more cheese fondue…. Thank you for this one-off show, Stefan. I wish every banker in the world were like you. Good taste and good ear for music. The best investment of your life! Thank you from Argentina. I was one of the lucky people who went at the Kongresshaus in December 18th 2007. If the show was organised and payed by bankers or not is not important. Because the show was simply perfect and i’m shure that most of the people in the audience did’nt work at the financal district of Zurich. there were friends an fans ! 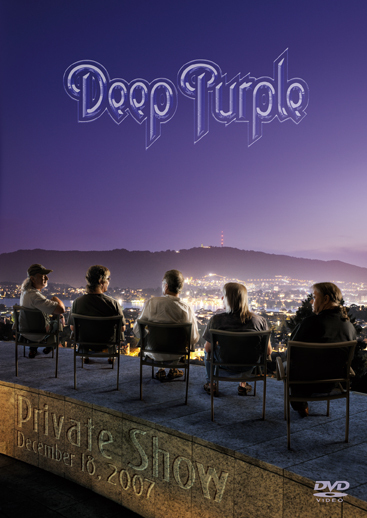 Enyoy the DVD and you will see – Deep Purple at his best ! I’m shure – Stefan is Rock n’Roller deep in his heart ! D Men who organiesed Deep Purple for friends for free in Zurich must bee rock n’roller at Heart !